The quality of your books will depend on these two elements. Every publisher produces books in nearly the same manner. The difference between quality books and so-so books lies in quality of the individual steps. A terrifically written book that is poorly designed may not be as successful as a poorly written book that has an outstanding design. Try giving the same manuscript to a book designer and one who design books and see which one will be easier and more enjoyable to read. Just as important is how easily the design worked through the stages to follow. A cookie can look good, but will it taste good? You can say that both books were "designed" just as putting a teaspoon of "imitation" vanilla extract in the chocolate chip cookie mix means the cookies contain "vanilla extract." In a small bowl, I mix 2¼ cups of King Arthur's white flour, 1 teaspoon of Morton's salt, and 1 teaspoon of Arm & Hammer baking soda. I use a hand mixer and slowly and thoroughly mix all three of these ingredients. I then set this bowl aside. I take another small bowl and mix two large eggs thoroughly and set this bowl aside. Next, I thoroughly mix 1 stick (cup) of Crisco's All-Vegetable Shortening, ¾ cup Domino light brown sugar, ¾ cup Domino granulated white sugar, and 1 teaspoon of McCormick's pure vanilla extract. I then thoroughly mix in the eggs to the sugar mix. When I am satisfied that I have brought the mix to be one, I add the flour mixture in three separate batches, mixing each batch completely. When all of the above ingredients are completely and thoroughly mixed (I didn't realize that I would be using the word "thoroughly" so much! ), I begin mixing in one 12 oz. bag (2 cups) of Nestle's semi-sweet chocolate chips and continue until I see that the entire mix takes on the appearance of one big cookie. It is important to note that while combining ingredients, you may experience taste requests from passersby and I want you to heed this warning: Under no circumstances allow anyone to "taste" the mix until you have finished mixing in the chips. This will prevent any imbalance that will occur if tastes are taken during the mixing process. Spoon small blobs onto a cookie sheet and bake at exactly 375° for 9 minutes. After 9 minutes monitor the baking and remove from the oven when the cookies appear to be darkening slightly. When you remove the cookie tray from the oven, set one end down on the counter and allow the other end to drop to the counter providing a shock to the cookies. This is critical in getting the correct appearance of the cookies. 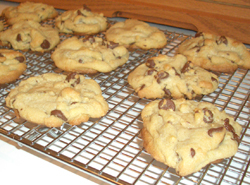 Allow the cookies to cool before removing them from the cookie sheet. There you have it: Designer Chocolate Chip Cookies. I usually get about fifty cookies per batch. Impress your friends and enjoy! Yes, it’s true. This is a recipe in a book design web page. Not only do I design books, I design food! I’ve been making these chips since 1979 and have shared this little secret with thousands of people. My recipe has even been published! It really is so simple it’s embarrassing. Lay the slices on a microwave rack that allows air to get up and through the rack. In other words, the rack must not be flat. I use one with grooves. 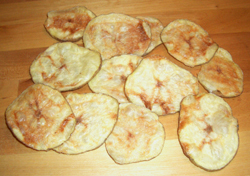 As the potato cooks, the moisture is removed and if the slices are on a flat surface, the potato will cook to the surface. Use something like a bacon rack. An average size potato will take approximately 10 minutes. Each potato is different and the thickness and number of slices will vary the cooking time. You need to watch each time you try this until you get a feel for how long it should take. Keep punching in another minute, or whatever, until you get the chips the way you like them. The potatoes will turn brown, but the best ones will turn light brown. The chips should break just like the real thing. You can experiment by putting different toppings on the slices before cooking. I use salt or McCormick’s Season-All. Have fun, eat healthy, and enjoy. If you need help with your chips or your book designs, let me hear from you! I can hear you now . . . WHAT?! Brown Sugar?! Yep, and it is incredibly good! If you like peanut butter (as I do), this sandwich is going to give the kind of sweet satisfaction Reese’s Peanut Butter Cups give you, but more. This sandwich has some heft to it. I mean, it is a meal! I don’t know how many calories it has, but it has to be a lot. Especially with the amount of brown sugar I use! If you can make a peanut butter and jelly sandwich, you are well on your way to making a PB&BS sandwich. It starts the same as PB&J, applying plenty of peanut butter to one side each of two slices of bread. I prefer to use Italian style sandwich bread or sourdough. The softer and more dense the bread, the better. With this sandwich, the bread is more than just a container, it is part of the mix. So you want a bread that is soft, yet firm in its density to hold the amount of peanut butter and brown sugar you are going to throw into this sandwich. I have found the Italian style sandwich bread works great. Now for the peanut butter. You can choose either creamy or crunchy peanut butter. I usually alternate when I make mine. I am a fan of JIF, (and Skippy), but you can use the peanut butter you prefer. If you don’t care, use JIF. Once you have both slices covered from edge to edge with peanut butter, you are ready for the main ingredient, the brown sugar. Now here is where we separate the imitators with the real thing. You MUST use Domino’s Light Brown Sugar. There is no substitute. If you choose to use another brand, you are failing the sandwich and yourself! I find the best way to apply the brown sugar is to reach into the bag and form a fist of sugar, grabbing as much as you can (big hands help) and gripping in such a way that is makes a semi-solid clump. Pull your hand out of the bag and place the “clump” of brown sugar on one of the slices. You can keep going back for more sugar if you feel you don’t have enough. Once you are satisfied with the amount of sugar, take the other slice of bread, turn it peanut butter side down and press it down over the brown sugar, spreading the brown sugar t the edges and forming a solid sandwich. You are now ready for a real treat. Take a big bite and enjoy the sweet delight of the peanut butter & brown sugar sandwich! You can run an extra couple of miles, or row an extra 5K to burn it off. If you want to take this to the next level, create the ultimate PB&BS double decker. More on that later!